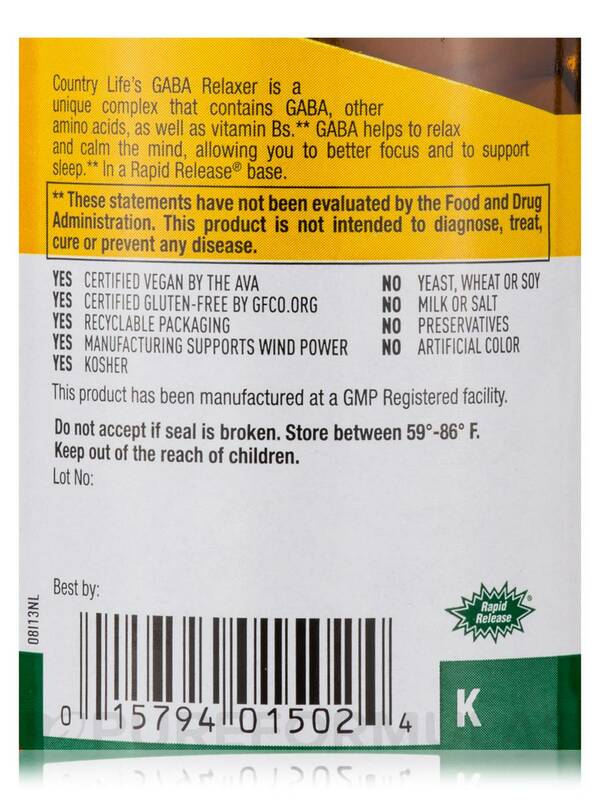 Gaba Relaxer™ 90 Tablets from Country Life® is a free form amino acid supplement with vitamin B6 that could help regulate muscle tone and supply your body with necessary proteins. 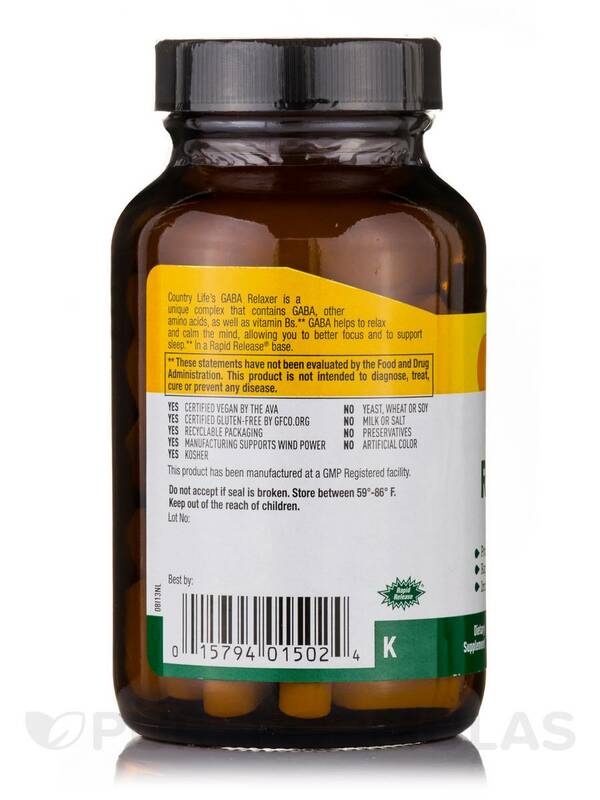 The supplement also includes vitamin B6 in the form of pyridoxine to help improve the use of amino acids. 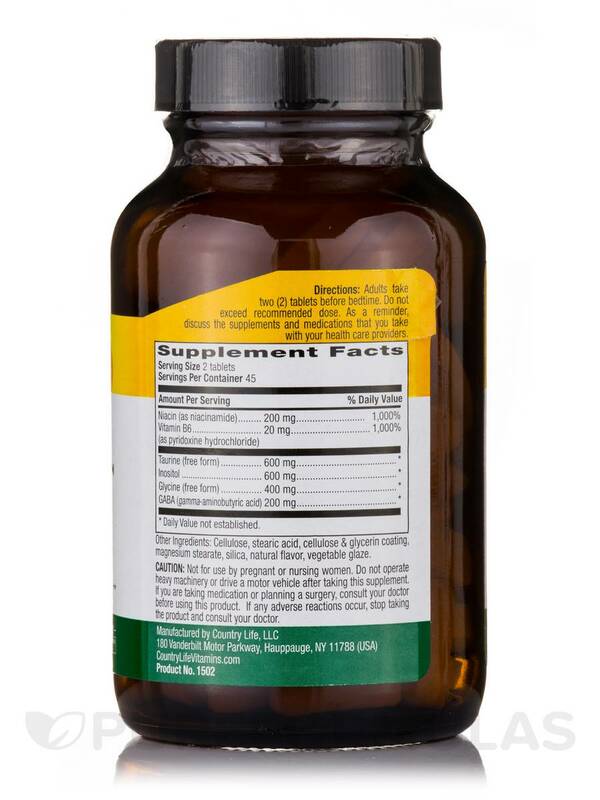 This supplement contains amino acids in varying forms‚ vitamin B3‚ B6 in the form of pyridoxine‚ and taurine‚ inositol‚ glycine‚ and gamma-aminobutyric acid (GABA). Niacin may help maintain overall good health and could be especially beneficial for a heart healthy lifestyle. Vitamin B6 might promote a good immune system. Amino acids are the building blocks for proteins. Taurine‚ an amino sulfonic acid‚ might help provide proteins for developing healthy platelets. Inositol‚ a vitamin-like substance‚ might help alleviate nerve conditions. Glycine is also an amino acid that is required for maintaining good overall health. The gamma-aminobutyric acid may potentially aid in regulating muscle tone and support the functioning of nervous system. 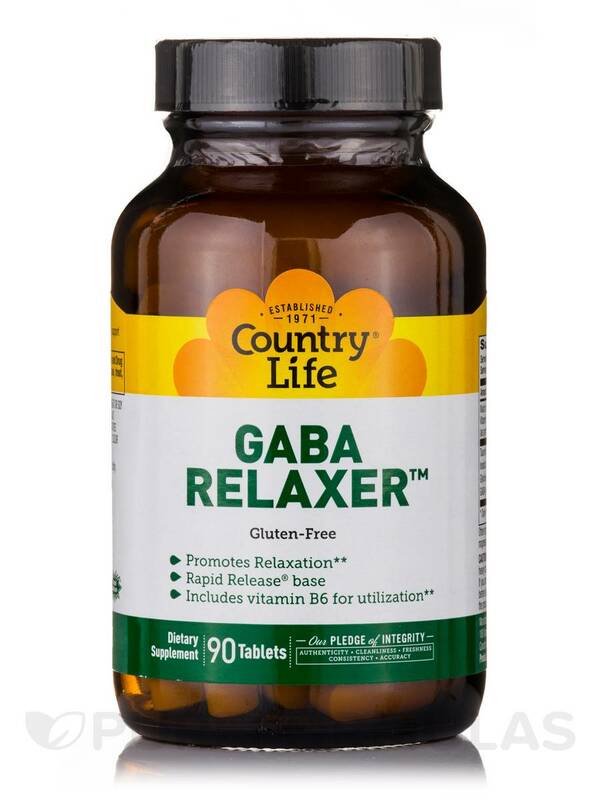 Gaba Relaxer™ 90 Tablets from Country Life® is a supplement that could help promote overall good health by regulating your muscle tone and efficiency of proteins in the body. Other Ingredients: Cellulose‚ stearic acid‚ cellulose & glycerin coating‚ magnesium stearate‚ silica‚ vanilla‚ vegetable glaze. Contains soy. Certified Gluten Free. Certified Vegan. Kosher. Does Not Contain: yeast‚ wheat‚ soy‚ milk‚ salt‚ preservatives or artificial color. Adults take two (2) tablets before bedtime. Do not exceed recommended dose. As a reminder‚ discuss the supplements and medications that you take with your health care providers. Not for use by pregnant or nursing women. 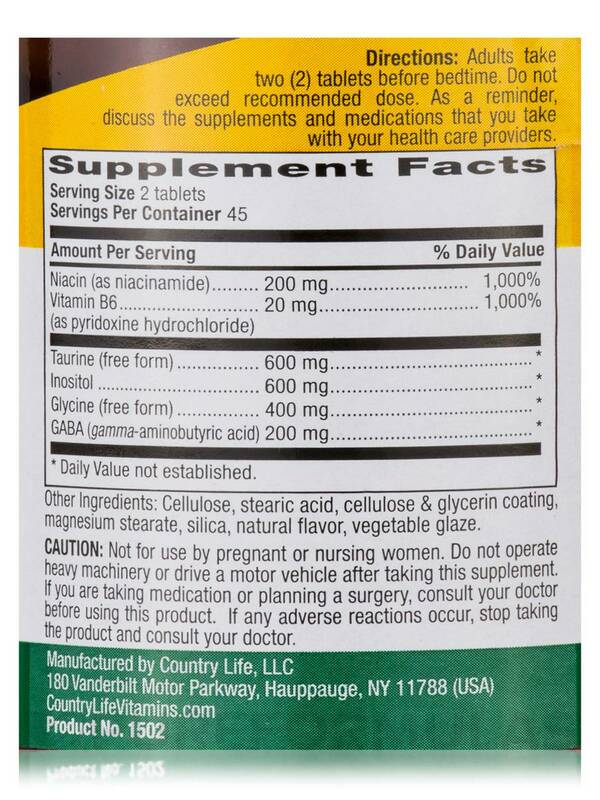 Do not operate heavy machinery or drive a motor vehicle after taking this supplement. If you are taking medication or planning a surgery‚ consult your doctor before using this product. If any adverse reactions occur‚ stop taking the product and consult your doctor. Gaba Relaxer by Country Life is a great product works well! Contains magnesium strate, silica, cellolose What is vegetable glaze? - Why did you order this product? I started taking this after I had an adrenal crash several yrs ago. - Did the product do what you wanted it to do? Yes its been very helpful in my healing journey. - Did the product come recommended by someone? (ex. a doctor or friend) Ive been on it so long I cant remember but I think my health practitioner suggested GABA &amp; this was the product I found. - Would you order this product again? Absolutely. Wouldnt go a day without it. I take quite a hefty dose (approved by my doctor of course). I take 10/day. And I can tell a difference whenever Ive tried to back off even one or two. This has definitely been a great tool in my recovery. I experience a lot of depression and anxiety not for any other reason than its just the way I am wired. I find tremendous relieve in taking one Gaba Relaxer in the morning helps tremendously with stress. I took a couple extra when I was experiencing a panic attack and was surprised how much better I felt in about 15 minutes. Everybody is a little different and will surely have different experiences. But for me I now make sure I always have some Gaba Relaxer on hand and definitely take one a day during more stressful times. It greatly reduces my feelings of stress and anxiety.